Rupert Pupkin Speaks: Warner Archive Grab bag - CHEYENNE, WHIFFS ""
I must admit to having underrated Raoul Walsh for a really really long time. Not sure what brought that on. I remember seeing HIGH SIERRA early on in my film education(during my 1st Bogart phase) and being kind of underwhelmed by it. From then on, for whatever reason, I thought of Walsh as "The guy who directed that Bogart movie I thought was just OK". I had seen ROARING TWENTIES and I think I was perhaps not in a "gangster frame of mind" or something cause that one didn't blow me away either. I think my appreciation for the greatness of Cagney came late so I skipped WHITE HEAT(until just last year) for a bit and got off the Walsh bus altogether. It wasn't until 2011, when a friend of mine turned me onto a few of Walsh's wonderful comedies(most notably SAILOR'S LUCK, ME AND MY GAL and THE STRAWBERRY BLONDE) that I finally "got it". Then I saw THEY DIED WITH THEIR BOOTS ON and I was completely won over. 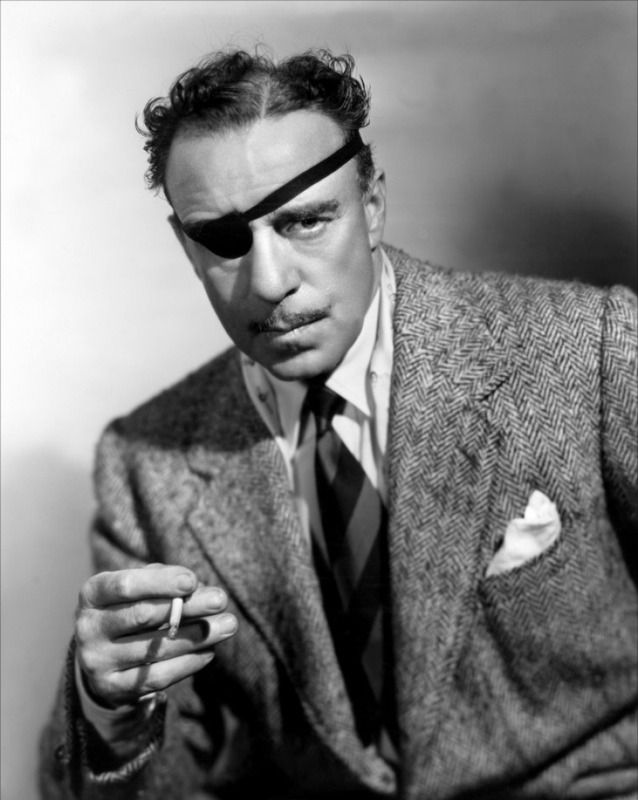 It was clear to me why the gang over at the Cahiers Du Cinema had fallen for this old eye-patch wearin' dude. So needless to say, the Walsh name carries a good bit more cache for me than before and I have been newly invigorated in digging into his filmography. I was quite excited to check out CHEYENNE, when Warner Archive released it and the podcast gang talked up there too so my expectations were through the roof. I had seen another Walsh western(PURSUED) previous to this, but it had been years. When I finally popped in the disc and heard the opening declarative notes of yet another triumphant Max Steiner score, I was already on board. Steiner to me is what John Williams is to other people(and me) I think. One of the great composers ever. He's a guy who is not afraid to announce himself and I really associate him almost inseparably with that old Warner Brothers logo. Suspected card sharp James Wylie(Dennis Morgan) is poker-ing in Laramie whilst on the run from a bad skirmish he got into back in Carson City. The law catches up with him there and offers him a deal. Amnesty in exchange for help capturing a notorious robber known only as 'The Poet'. 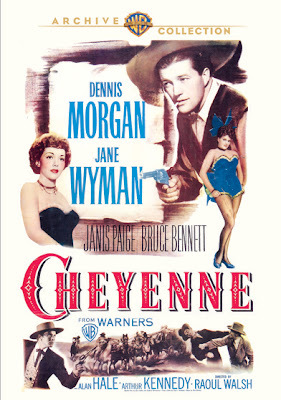 Morgan ends up on with Jane Wyman's character on the stage to Cheyenne(where he's to infiltrate The Poet's gang) and she couldn't be more grumpy. She's always played a pretty decent grouch though and here's no exception. This film reminded me slightly of Fritz Lang's RANCHO NOTORIOUS, but with a few different nooks and crannies. Arthur Kennedy being in both movies certainly ties them together a little bit. Overall, just a well-made, twisty-turny, mystery western. All the back and forth stuff makes it feel noirish(not unlike PURSUED). Among my favorite 'discoveries' of 2013. Like many of you out there, I am a big fan of 1970s cinema. What a glorious time. So many interesting and often oddball films were made, and there were many great (if unlikely) movie stars born during that decade. One of my favorite such stars is the incomparable Elliot Gould. His take on Phillip Marlowe in THE LONG GOODBYE is one of my favorite things in life. But he turned in so many outstanding performances in the 70s. From the critically acclaimed M.A.S.H. to LITTLE MURDERS, THE SILENT PARTNER, BUSTING and CALIFORNIA SPLIT. He's quite a dynamo from my point of view, so when I come across one of his 70s films I've not even heard of, my curiosity is piqued immediately. Such was the case for 1975's WHIFFS, an offbeat military comedy about nerve gas and bank robbery among other things. Gould plays private Dudley Frapper, a 15 year veteran of the U.S. Army's Chemical Corps - whose motto(as decreed by commanding officer Eddie Albert) is "We don't want to kill the enemy. We just want to make him a little sick." He and his comrades are guinea pigs for various chemical weapons used by the Army. After an unexpected medical discharge, an underwhelming monthly disability payment setup, and several dead-end jobs, Frapper is left to turn to a life of crime. A (slightly) screwball life of crime that is. The comedy is much more subtle than I expected actually. Pretty low-key. When a movie opens with the words, "This film was made without the cooperation of the United States Army", you know it's gonna be memorable on some level at the very least and this film is....somewhat. Jennifer O'Neal is certainly memorably cute here. 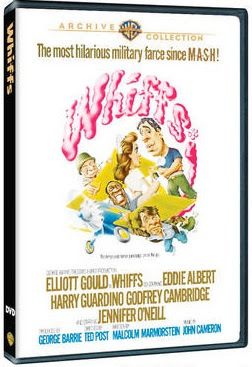 WHIFFS looks to have had a few vhs releases(Magnetic Video, Media), but they were of course pan and scan transfers so this is the first time it can be owned in its original 2.35 to 1 glory. It was originally made by Brut Productions(yes THAT Brut) as part of group including NIGHT WATCH, HUGO THE HIPPO, I WILL I WILL..FOR NOW(also just released), SWEET HOSTAGE and James Toback's FINGERS. The company only produced about 14 films from 1972 to 1979. I love Walsh. You should check out Objective, Burma! It's a war movie with Errol Flynn, but it's not like anything else Flynn did. No gigantic heroics or sweeping battlefield scenes; it's pretty small scale and low-key and it's one of the best war movies I've ever seen. Anyone in the Army for 15 years and is still a private has some problems!